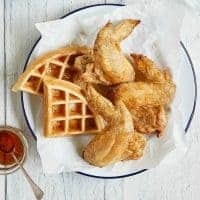 Air Fryer Fried Chicken and Waffles is a quick and easy breakfast recipe that combines sweet and savory for the perfect meal. This dish also works great for a weekend in-home brunch. 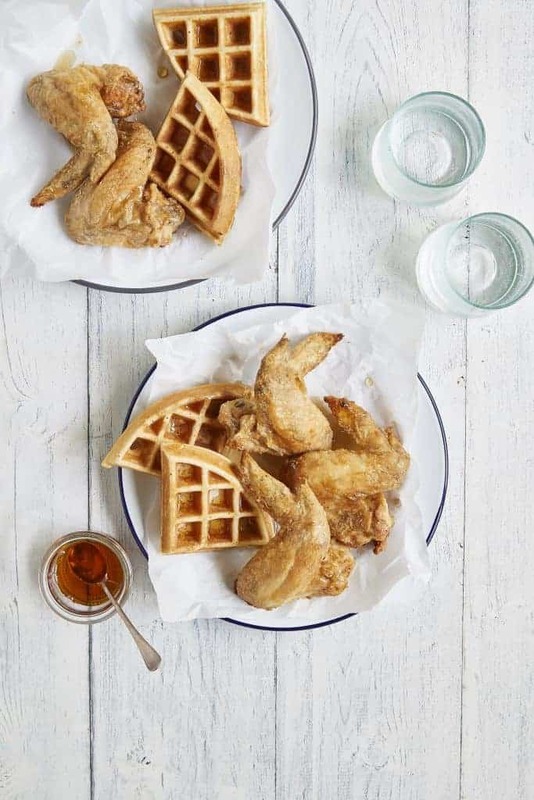 The air fryer produces crispy crunchy chicken wings paired with waffles that are drizzled in maple syrup. One of my favorite recipes from my cookbook, the Super Easy Air Fryer Cookbook is the Fried Chicken and Waffles. It should come as no surprise that the recipe made it to the cover of the cookbook! 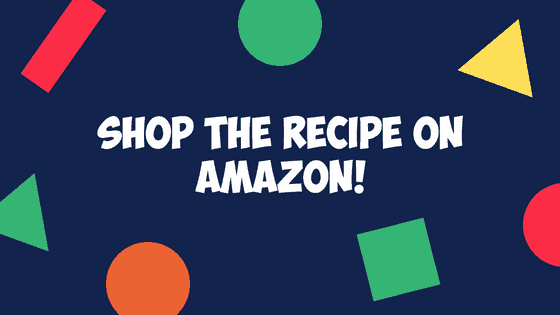 Be sure to grab your copy of the cookbook today here on Amazon. If you are a fan of sweet and savory meals, this recipe is definitely for you. I frequently order chicken and waffles while dining out for brunch. I love that the chicken is also served with hints of syrup. It tastes amazing! You can find a ton more recipes like this one in my cookbook. 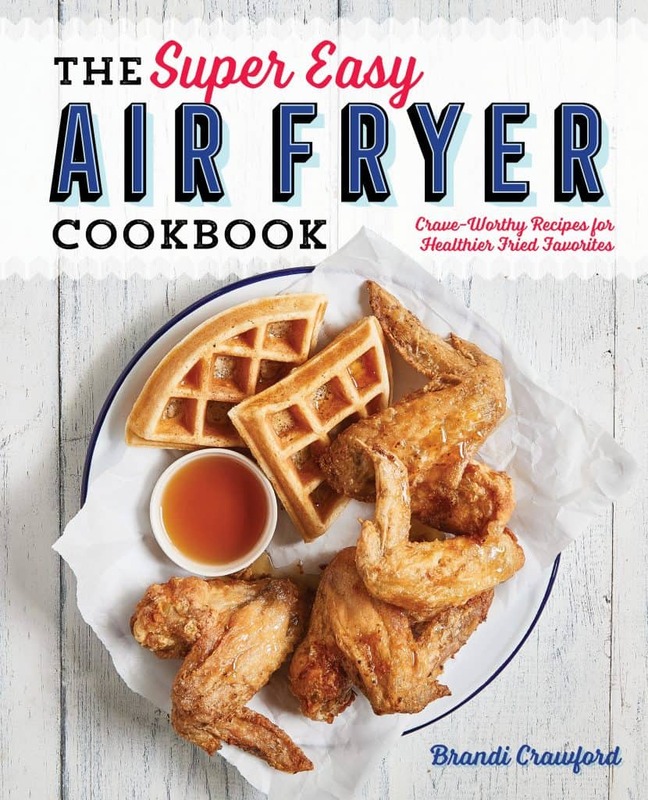 The cookbook has 100 air fryer recipes. 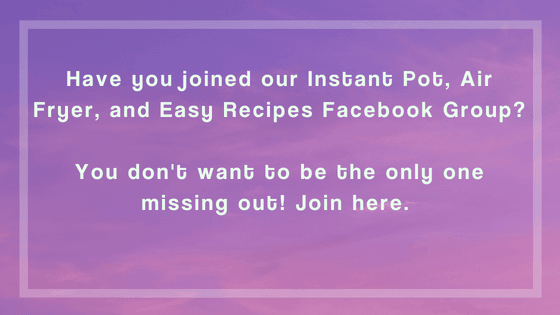 The recipes are incredibly easy to make and include everyday ingredients that you will find in your fridge and pantry. 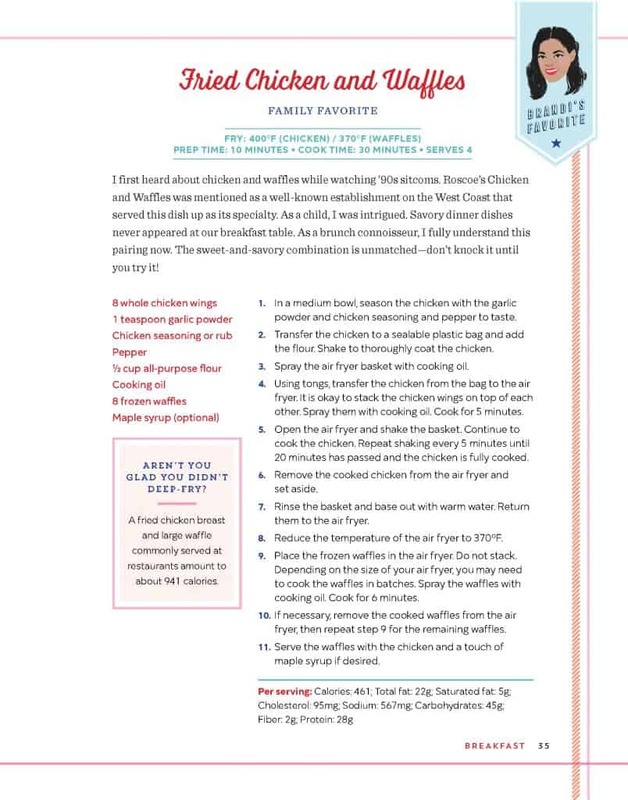 Though I love dining out, you can cut most of the fat out of this recipe by staying in and using the air fryer. Restaraunt chicken and waffles have about 940 calories per serving. You can cut that in half with this recipe. If you are looking for more Air Fryer Recipes, check out 16 Must TryAir Fryer Recipes. In a medium bowl, season the chicken with the garlic powder and chicken seasoning and pepper to taste. Transfer the chicken to a sealable plastic bag and add the flour. Shake to thoroughly coat the chicken. Using tongs, transfer the chicken from the bag to the air fryer. It is okay to stack the chicken wings on top of each other. Spray them with cooking oil. Cook for 5 minutes. Open the air fryer and shake the basket. Continue to cook the chicken. Repeat shaking every 5 minutes until 20 minutes has passed and the chicken is fully cooked. Remove the cooked chicken from the air fryer and set aside. Rinse the basket and base out with warm water. Return them to the air fryer. 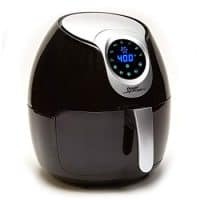 Reduce the temperature of the air fryer to 370 degrees. Place the frozen waffles in the air fryer. Do not stack. Depending on the size of your air fryer, you may need to cook the waffles in batches. Spray the waffles with cooking oil. 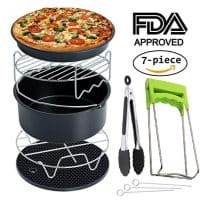 Cook for 6 minutes. If necessary, remove the cooked waffles from the air fryer, then repeat step 9 for the remaining waffles. 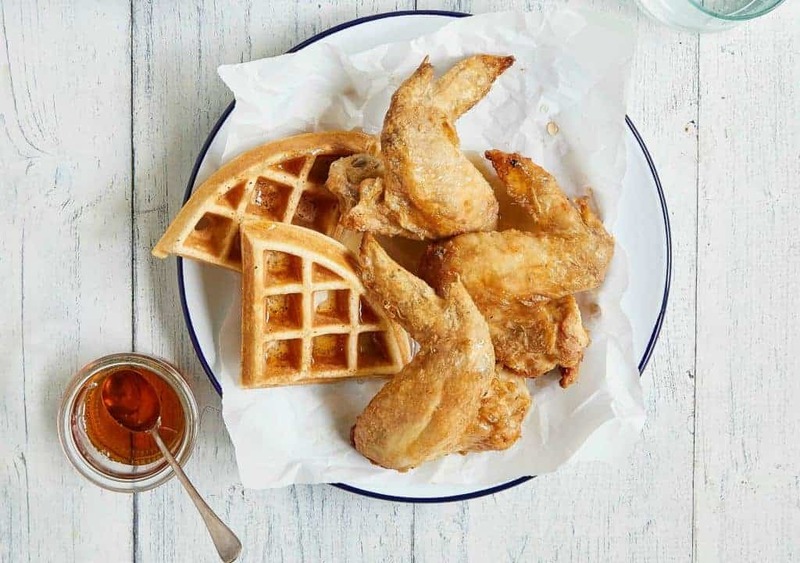 Serve the waffles with the chicken and a touch of maple syrup if desired.